Plenty to look forward to after 4 solid efforts. Wednesday was a busy day for us all here at Stockton Hall with 3 runners in total between 2 different tracks. The first runner of the day was at Newbury where Zalvados went to post for the Juvenile hurdle, he was making both his hurdling and stable debut and put in a very pleasing effort to finish 2nd behind a 128 rated horse who had previously won over hurdles in france so had more experience in this sphere. He travelled and jumped very professionally before getting slightly outpaced coming to the last. Jake looked after him on the run in and he seems to have an exciting future ahead of him. Our last two runners of the day were at Kempton where we were doubly represented with Spirit of the Vale and Los Cerritos running in the first and second races . Kevin Stott took both the rides and was aiming to repeat the tactics he used when steering Spirit of the Vale to victory when she last ran at Newcastle, she ran a good race again making up plenty of ground in the straight to finish 4th in a competitive race. Los Cerritos put up a better effort to finish 4th in a equally competitive race, i was slightly disappointed he didn't go on to win from a good position turning for home but i feel we are learning more and more about him now and it shouldn't be long before he gets his head in front. 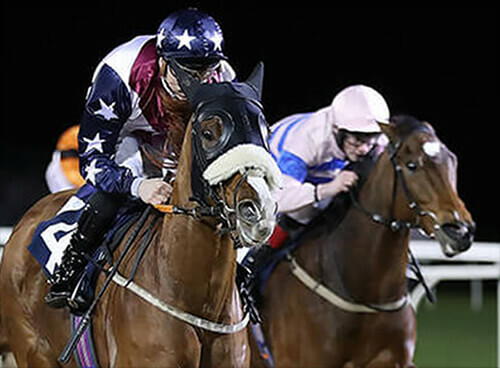 On Thursday we headed to Ludlow with Badbad Leroy Brown who was making his second start over hurdles in a top class field, he showed us more than last time and will be more competitive when able to race in low grade handicaps.